Meeting of Club but Slimly Attended. A public meeting was held last evening at Mount Olivet [sic] Baptist Church, 85 Seventh street, by the Colored Women’s Equal Suffrage Club for the purpose of interesting the colored voters of the city and state in the cause. Unfortunately, the meeting had not been sufficiently advertised to bring out a large attendance, but those present were enthusiastic for the cause. Mrs. Hattie Redmond is secretary of the club; Mrs. Kate Gray, president; Mrs. Lancaster, vice-president and Mrs. Edith Gray, treasurer. 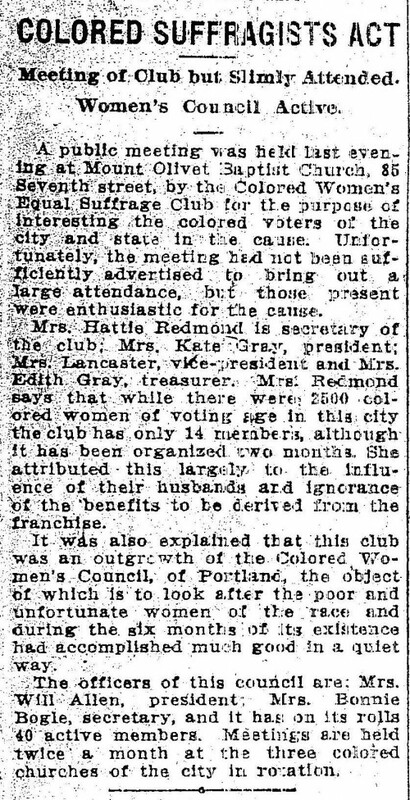 Mrs. Redmond says that while there were 2500 colored women of voting age in this city the club has only 14 members, although it has been organized two months. She attributed this largely to the influence of their husbands and ignorance of the benefits to be derived from the franchise. It was also explained that this club was an outgrowth of the Colored Women’s Council, of Portland, the object of which is to look after the poor and unfortunate women of the race and during the six months of its existence had accomplished much good in a quiet way. The officers of this council are: Mrs. Will Allen, president; Mrs. Bonnie Bogle, secretary, and it has on its rolls 40 active members. Meetings are held twice a month at the three colored churches of the city in rotation.